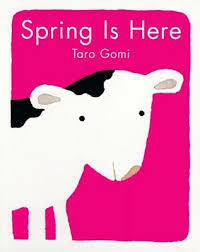 Taro Gomi and his short little book, Spring Is Here, get the honor of being the first book reviewed. Why? Because I personally feel calmer each time I read it. It’s like a little exercise in Zen every time I read through the book and watch the progression of the seasons (in an ecologically realistic way). I especially like the zooming in on the cow, which brings you to soil sprouting seedlings. Well drawn, simple, and easy to read to a young toddler. With a positive message of the cyclical nature of time. Below is a little video of someone reading (and then singing it if you want more). As you can see, a nice little book to read.